So many kayakers spend their days inshore on freshwater lakes and rivers targeting their favorite species: Bass, pike, muskie, catfish, bluegill and the likes. Other kayakers fish the saltwater coastal areas for redfish, trout and flounder. But, there is a growing group of kayak anglers who dare to be different; they challenge themselves to the extreme and head offshore. The waters of the Atlantic feature the Northeast striper as the prized catch, along with fluke. The Southeast coast brings sailfish, kingfish, mahi, wahoo and other species. Traveling across this great country, the Pacific extreme kayakers look for rockfish, sea bass, halibut and even salmon during the run. 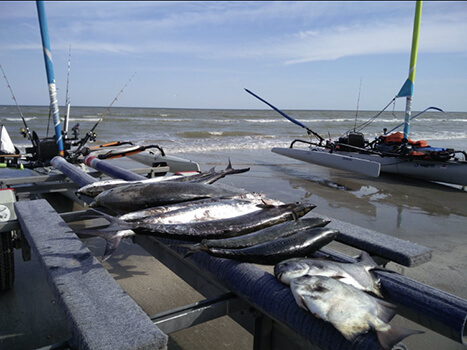 Gulf Coast kayak anglers look for kingfish, cobia, red snapper, mahi and amberjack. But what drives these anglers to fish in 50 feet to 300 feet of water or more out of a kayak? William Swann, of Texas City, Texas, and Jason Graves, of Sacramento, California, sat down with us to give us their thoughts and insights. We queried Graves as well, and he cited the same reasons as Swann, and more. We asked each about their kayak of choice for their adventures, and Swann chimed in that he fishes in a Hobie Adventure Island. “It has given me an amazing amount of freedom, and I regularly go out 15 to 20 miles when the wave height permits,” he said. 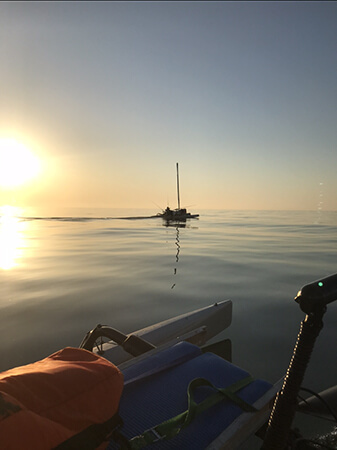 On the other hand, Graves paddles his way a couple of miles into the Pacific on his Feel Free Lure 13, where water depths can reach hundreds of feet quickly. Swann commented that he must go that far to get into 60 – 70 feet of water where he hunts his prey. Gear is different between all kayak anglers. From shorter light poles used in fresh water to medium stiff in saltwater coastal areas, the offshore kayak angler gears up big. Anchors are not used, but possibly a drift sock to slow you down in a fast current. “The same gear as someone will use in a 30-foot offshore boat, is what I need on my kayak,” Swann said. Graves agreed, but added that the big difference he found is the accessories and other gear he brings. Both Graves and Swann mentioned their RAILBLAZA RodHolder IIs as their offshore rod holder of choice. The ability to lock in the rod, as well as the floating gimble, made it their favorite. Each uses their Rod Holder II on different bases. RAILBLAZA offers seven options to fit your rigging of choice at RAILBLAZA.com or your local kayak shop. So recently over the last three to four years, these extreme offshore anglers get to challenge themselves and their fellow kayakers who share the same offshore passion. Tournaments like the Extreme Kayak Fishing Tournaments out of Pompano, Florida, and the new Rey Del Mar Offshore and Inshore Tournaments in Texas are a great way to meet up with fellow anglers who share that love of the unknown. At these tournaments you meet some great people who don’t look at you funny when you tell them you fish offshore. They all nod and agree — it’s the chase for the unknown.